Tea from north Thailand’s wild growing Camellia Sinensis Assamica tea tree, processed according to Pu Er style method. 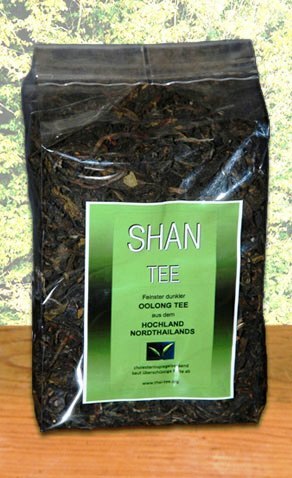 ShanTea is a postfermenting tea from wild-growing tea trees in the border region between north Thailand and Myanmar. Extremely individual taste of the orange-brown cup, coined by sun-drying and charcoal roasting. During the years of ripening, the initially dominant grassy note has meanwhile given way to rather earthy and sweet dry fruit flavors. And because of its wild character, ShanTea is 100% pure nature!